A dental abscess, or tooth abscess, is an accumulation of pus that forms inside the teeth or gums. The abscess typically originates from a bacterial infection, often one that has accumulated in the soft pulp of the tooth. Bacteria exist in plaque, a by-product of food, saliva and bacteria in the mouth which sticks to the teeth and damages them, as well as the gums. 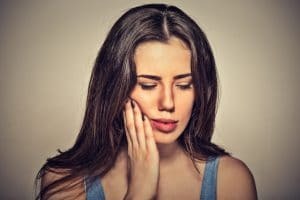 If the plaque is not removed by regular and proper tooth brushing and flossing the bacteria may spread within the soft tissue inside the tooth or gums, eventually resulting in an abscess. Gingival abscess – the abscess is only in the gum tissue and does not affect the tooth or the periodontal ligament. Periodontal abscess – this abscess starts in the supporting bone tissue structures of the teeth. Periapical abscess – this abscess commences in the soft pulp of the tooth. Treatment involves draining the abscess, which usually stops the pain immediately, and then controlling the infection and removing its cause. This may require antibiotics and any of several in-office dental procedures, including gum surgery, a root canal, or a tooth extraction. The best way to prevent an abscess from forming in the first place is to practice conscientious oral hygiene. By brushing your teeth twice each day for two minutes, and flossing at least once a day, you will go a long way towards keeping harmful oral bacteria from thriving in your mouth. If you have any questions or would like to schedule a complimentary initial exam, please contact Affiliated Orthodontics at our Peoria AZ office.